Lincoln City, Oregon, is among the Oregon Coast's most popular destinations, offering everything from kite flying in the summer to storm watching in the winter. This coastal town is situated between Tillamook and Newport and, not surprisingly, was named for former U.S. president Abraham Lincoln. In 2017, Lincoln City was the first city in the path of totality to view a total solar eclipse. Besides rare natural phenomenal, Lincoln City has plenty of other great attractions, ranging from cool shops and galleries, tasty food and drink, and special events. Lincoln City's miles of sandy beach is its primary attraction. Kite flying, beach combing, shellfishing, whale watching, and tide pooling are all favorite beach activities, along with walking, wandering, and watching the waves roll in. Some hardy souls even surf. The beach can be accessed from points all along the coastline. Roads End State Recreation Area, at the north edge of the city limits, has limited facilities but wide open beach access. Other great options include the "D" River State Wayside, where the river and ocean meet, and Josephine Young Memorial Park, which has picnic areas, bay access, wooded areas, and restrooms. The former is a hotspot for kite flying events. The forests, lake, rivers, and creeks around Lincoln City provide beautiful terrain for hiking along nature trails. 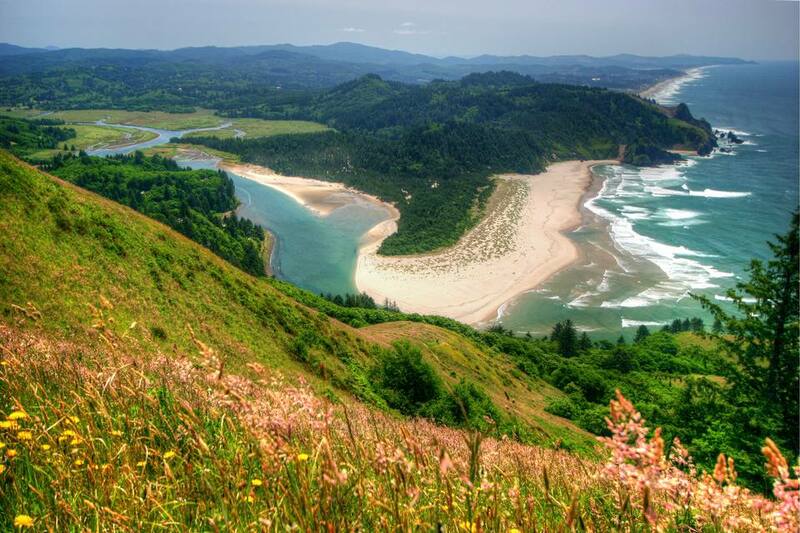 Cascade Head is home to two different Nature Conservancy trails, both rich in wildlife and wildflowers, while the Drift Creek Falls trail in Siuslaw National Forest passes through lush rainforest and across a suspension bridge, where you'll be rewarded with a fantastic waterfall view. If you want a more leisurely hike, try the Cutler City Nature trail, a one-mile trail that passes through woods and wetlands, or the Hebo Lake Loop trail, also in Siuslaw National Forest, a family-friendly, less-than-one-mile trail that circles the lake. Devil's Lake provides a wealth of water recreation opportunities, from motor boating and water skiing to canoeing and kayaking. On Devil's Lake, boat launches are located near the campground on the north side of the lake and at the East Devil's Lake day-use park. Paddlers can enjoy a guided trip at Siletz Bay, which is a national wildlife refuge. Glass art is significant in the Northwest, and the Oregon Coast communities have embraced the colorful art form wholeheartedly. Many local glass blowers allow you to watch or join in through a class or workshop. You'll find the work of glass-blowing artists at Sears Glass Art Studio, Alderhouse Glass, and Mor Art. Additionally, if you see a blown-glass floating sphere along the shoreline while walking along the Oregon coast, then that "Finders Keepers" artist-signed and numbered piece of art is yours to keep. More than 3,000 are dropped between mid-October and Memorial Day. You know the great thing about shopping in Lincoln City? Like all of Oregon, there is no sales tax. Charming local boutiques, candy stores, and gift shops can be found up and down Highway 101. Meanwhile, bargain and deal hunters will love exploring the outlet stores at Tanger Outlet Mall, which include Coldwater Creek, Jones New York, Columbia Sportswear, Nike, Reebok, Harry & David, and Bath & Body Works. Don't miss shopping for local goodies though at the Lincoln City Farmers and Crafters Market. Held on Sunday all year-round, this farmers market offers locally-grown produce, baked goods, prepared foods, and handcrafted items. It is held indoors at the Lincoln City Cultural Center during the cold months and moves outdoors when it's warm. Live entertainment and food are also a part of the Sunday market experience. Local history and culture is preserved and presented throughout the exhibits at the North Lincoln County Historical Museum. Many exhibits focus on life and industry in the late 19th and early 20th centuries, but are unique compared to what you might find in similar small historic museums; a past exhibition focused on 1950s advertising in the county. The presentation of glass fishing floats is a museum highlight. Fresh seafood and Pacific Northwest cuisine are an essential part of any Oregon Coast experience. Have clam chowder and seafood at Mo's Restaurant, and you'll instantly understand why the former is a favorite up and down the Oregon coast. The Lincoln City location overlooks the bay, making for great views while you enjoy clam, crab, cod, shrimp, and oyster dishes of all kinds, as well as beer and wine. Starting in the spring and throughout the warmer months, Lincoln City hosts several festivals featuring kites, fireworks, and sand castles. Plan your visit around the Summer Kite Festival, a two-day kite flying festival in June, including kite making, competitions, and kite performances, or the Lincoln City Sand Castle Competition. On one day in August, a sand castle competition is held at Siletz Bay. That night, enjoy s'mores by a beach-side campfire. Meanwhile, foodies will love Chowder and Brewfest. Celebrate the comfort food of the Oregon Coast along with signature craft beers from regional breweries in September. Enjoy live entertainment throughout the day and take part in fun games. Tuck into an ice-cold pint and bowl of clam chowder at Lincoln City's McMenamins Lighthouse Brewpub, an Oregon staple. McMenamins serves their own selection of locally-brewed beers, including the Cascade Head, a pale ale named after Lincoln Head's wildlife preserve. Lincoln City is also home to Chinook Winds Casino Resort, a 157,000-square-foot resort that boasts 1,200 slot machines, table games, poker, keno, and more. The casino is open 24 hours per day and includes a full-service hotel and six restaurants.